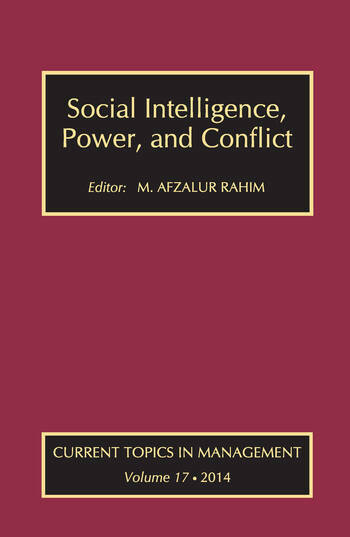 This volume is focused on the social intelligence (SI) of leaders. SI is generally defined as the ability to be aware of relevant social situational contexts; to deal with the contexts or challenges effectively; to understand others' concerns, feelings, and emotional states; and to interact appropriately in social situations and build and maintain positive relationships with others. Beginning with a cross-cultural study of the social intelligence of leaders in the United States, the United Kingdom, Scotland, Hong Kong, and Thailand, the work moves on to discuss the influence of SI on creative performance. The findings of the study show that leaders' SI was positively associated with their creative performance in each of the five countries. Other contributions cover topics relating to SI such as social connection and executive compassion. In addition, the volume also features five book reviews, a list of books received, and a detailed case study, titled "Program Management for Global Software Development: A Case Study of the Windows Embedded Automotive Team" by Paul Gratton. The work will be of use to those studying business, management, and economics.